The Pride of Houston Yaupon in an improved selection of the native Yaupon Holly, Ilex vomitoria. 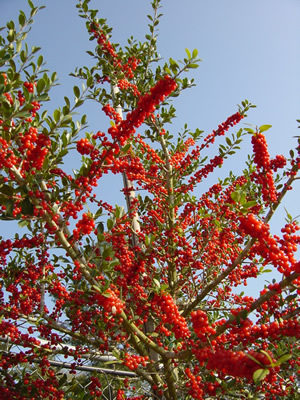 Pride of Houston has a more upright and uniform growth habit, a better branching structure, and will produce more berries than the species. Pride of Houston can grow in almost any soil and can live in wet or dry, rich or poor soil. Its leaves are narrow, inch-long, toothed, dark green leaves. This Yaupon can get to a height of 15 feet tall and 8 feet wide.